Protestors won’t give up the fight against the harmful WestConnex motorway works. Credit: Lorrie Graham. Last Friday, residents of apartments on the corner of Euston and Sydney Park Rd in Alexandria scored a small win. The NSW government has decided that instead of building the Westconnex motorway less than two metres from their house, it will now be between 3.5 and four metres. In March, Mr Davies and other residents were invited to a Sydney Motorway Corporaion (SMC) WestConnex briefing at which they were shown the design for a road that will deliver at least 60,000 extra cars a day past their doorsteps. “This is it” they were told. The design was a fait accompli with no room for negotiation. But Mr Davies and his partner Carmel Delprat, along with other residents and campaign groups across the vast WestConnex route, held pickets and rallies supported by both Labor and Greens MPs. A photo of a child lying across the space between the road and their homes spread fast. 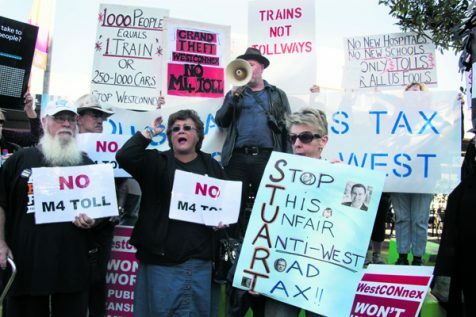 In early June, they helped organise a rally in Western Sydney outside the office of the Minister for Western Sydney and Westconnex Stuart Ayres. Penrith Valley Community Unions secretary Mary Court told the rally she was opposed not just to decades of tolls but also the whole of Westconnex and its social impacts on Sydney communities. Just a few days after the Penrith rally, the NSW government agreed to a review of the design. But not before trees lining the footpath outside the Euston Rd apartments had been swept away. When Mr Davies tried to find out the review’s terms of reference and what evidence would be used in decisionmaking, he received no meaningful answers from either NSW Planning or NSW Roads and Maritime Services (RMS). As he fumed at this lack of accountability, he watched a deep trench being built outside his apartment. In fact the ‘review’ did not take long. The decision to remove a bus turning lane from the design sat on Minister Ayres office for several weeks until Friday’s announcement. But this recent good news doesn’t explain why the design was approved by NSW Planning in the first place. Neither NSW Planning nor RMS can plead ignorance. Residents’ submissions to NSW Planning’s Environmental Impact Statement (EIS) assessment process strongly objected to the Euston Rd impacts. Media stories drew attention to health risks of building a road so close to children’s bedrooms. But the approval document signed by the Minister for Planning Rob Stokes in late 2016 made no mention of the intersection. If SMC hope they’ve won over the Euston Rd community, they are wrong. Mr Davies sees his situation as part of a deeper problem, describing the lack of accountability in the planning process as a form of corruption. The news at St Peters was not so good last week. On Wednesday, residents were given three days notice of 18 days of consecutive excavation works, including three consecutive weekends of day and night work. This is the same community that has suffered months of sickening odours for the Westconnex interchange site that were also not dealt with during the Department of Planning’s consideration of the impacts of the New M5 EIS. The New M5 approval conditions set out normal working hours from Monday to Saturday for works, other than tunnelling, which can be 24 hours a day, seven days a week. But there’s a catch. Work outside these hours can be approved if 5 days notice is given. Only two weekends ago, SMC’’s WestConnex CPB contractors worked late into Saturday night without notice..
St Peters resident and WestConnex Action Group member Tamara Regan and her family have lived through months of WestConnex dust, vibration and noise as nearby homes were demolished. Ms Regan has filmed breaches of asbestos removal and been diagnosed as suffering health effects from months of shocking odours from the Alexandria landfill turned tollway excavation site. “I don’t know how much more of this we can take. …We got 3 days’ notice and they didn’t offer residents any alternative accommodation.” In other areas, residents have been moved into temporary accommodation at a cost to the project of up to $2000 per household a night. In fact, little work was done in St Peters over this weekend, perhaps because a WestCONnex Action Group release on Friday drew attention to the short notice. Residents don’t know what to expect in coming weekends. Meanwhile more bad news arrived for the Regan family when SMC announced last week that they will take over parts ot Tempe reserve including netball courts used by the City of Sydney Netball Association for a temporary work site for four months. Ms Regan’s daughter is a keen member of the club. This Tempe work site was also not mentioned in the original EIS and is outside the project boundary. The Inner West Council that controls the reserve opposed it but SMC used its power under the Roads Act to override Council. A spokesperson for the Inner West Council told City Hub that the Council is negotiating for ‘significant compensation.“ The President of the 50 year old award winning City of Sydney Netball Association Suzanne Simpson told City Hub that the disruption will cause the Association “a major loss of income, goodwill and continuing membership…” So far, the Club has received no compensation. The feedback period for the Concept design for Stage 3 tunnel across Sydney’s Inner West ends this week . Hundreds of submissions have been submitted objecting to the project. Within weeks, SMC will lodge another EIS. No doubt, the Gladys Berejiklian government and NSW Planning bureaucrats are gritting their teeth to weather the storm before pushing ahead with the Western Harbour tunnel, Northern Beaches Link and a Southern tollway. Along with these would go parts of North Shore parkland, Rockdale Wetlands, the Royal National Park and hundreds of homes. This bad news would’ve been safely hidden from the NSW public but for a series of recent Cabinet leaks to the Sydney Morning Herald. In response to news of unfiltered stacks on the North Shore, the now Minister for Education Stokes said he wouldn’t countenance unfiltered stacks near North Shore schools despite the fact that he has approved unfiltered stacks near schools In St Peters, Haberfield and Kingsgrove. This sort of hypocrisy deepens resentment. Two weeks ago, a Lantern parade from all corners of the M4 M5 route snaked its way to Camperdown Park, near the site of a proposed massive construction site. The government may believe it can ride roughshod over the Inner West but it will be more anxious about messages of support from groups in Northern, Southern and Western Sydney where residents increasingly realise that the environmental and economic costs of being the private tollway capital of the world wil be borne for decades. Wendy Bacon is part of the campaign against Westconnex. Photo by Lorrie Graham.